Samford University graduates posted the highest first-time pass rate on the Certified Public Accountant (CPA) exam of any university in Alabama, according to a report from the Alabama State Board of Public Accountancy. 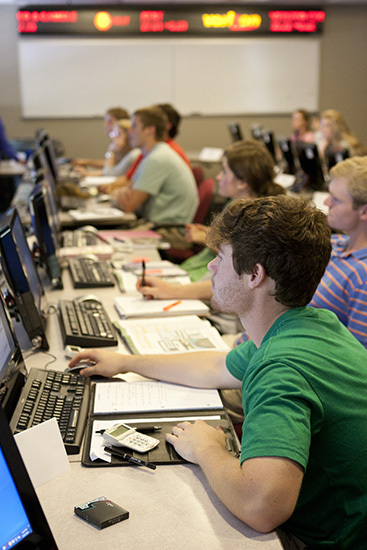 “Of candidates sitting for a given part of the CPA exam [there are four separate parts] for the first time, Samford students pass that part on their first attempt at a higher rate than any other university’s graduates in the state of Alabama,” said Lowell S. Broom, professor of accounting in Samford’s Brock School of Business. Broom was notified of the high passing rate by the executive director of the Alabama State Board of Public Accountancy. “The passing rate is approximately 50 percent higher than the national average,” Broom noted. The accounting major in Samford’s Brock School of Business is designed for students who wish to become CPAs, auditors, corporate accountants or enter other accounting professions. Broom noted that, over the past three years, approximately 99 percent of Brock School of Business accounting majors seeking employment have been employed within three months of graduation. The Brock School of Business is accredited by the AACSB, a distinction earned by less than 5 percent of business schools in the world. It also offers a master of accountancy program in its graduate program.